The publicist says that when she goes out to tend to us goats she always feels like she is being watched. Hmmm, maybe she has a point. Remember I told you about my friend Millie's human? How she wrote a book? 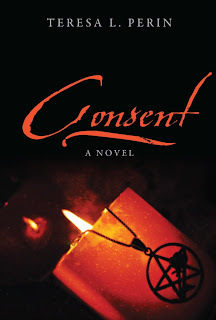 Well the publicist read the book, it is called Consent: A Novel. I did not get to taste it. You can read the publicist's review and enter to win your very own copy! I might enter so I can have something good to eat read.